The prep comeback is dragging the style’s footwear of choice back into the spotlight. Fashion moves in trends, dredging up things we thought we’d never see again—pleated pants, dad shoes—and deeming them cool. For a while, though, it was safe to say the boat shoe wouldn’t follow that pattern. The shoe—beloved by people who use summer as a verb, Guys Who Own Boats, and those who believe pink button-downs tucked into shorts is the apex of summer style—feels completely out of place in an era where we’re trying to get away from ideas originating in the Hamptons. But no one told Noah about this incongruence. The street-meets-prep label just released another collaboration with Sperry Top-Sider, the OG boat shoe brand—and it sold all the way out. Every size of the $300 (!!) boat shoe, which was released earlier Thursday, is already gone from Noah’s site. And, sure, we don’t know how many were made but the other collaborative item Noah made with Sperry, your standard Vans-looking sneaker, is still available in a majority of sizes. We’re not declaring that the boat shoe comeback is on just because one of the most popular streetwear brands in the world released a version. Truthfully, the shoe isn’t really that spectacular—which is sort of the remarkable thing here. Past collaborations between Noah and Sperry produced boat shoes cast in unusual shades like eggplant and coral or in a combination of colors that can only be described as circus tent. 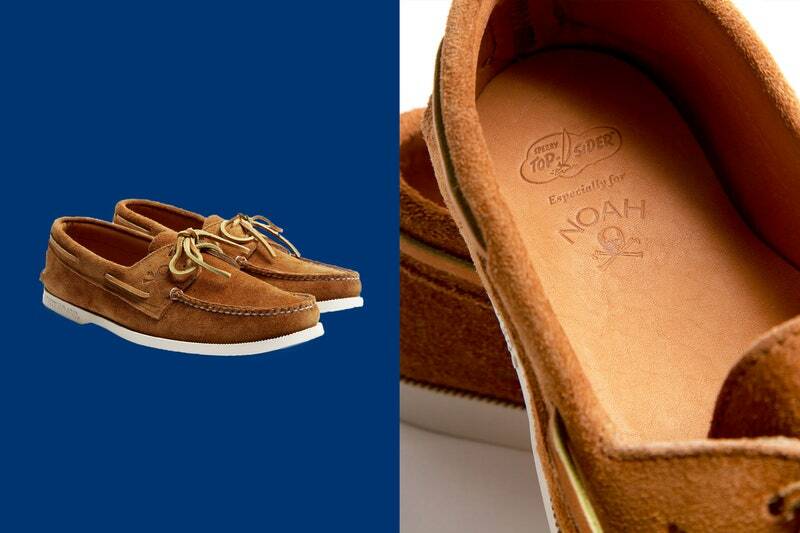 This time around, Noah’s version of the boat shoe is done up in a brown suede with a white sole. There’s also a skull and crossbones stamped on the side. You can find a pair that’s pretty damn close to that in Sperry’s core collection. Noah didn’t have to massage or rework the boat shoe to distance it from the original for it to sell out—the brand proved that a pretty standard boat shoe can create waves. Noah’s success with the boat shoe is the latest evidence that the prep comeback is fully underway. Brands like Noah, as well as Rowing Blazers, have married aspects of streetwear and prep since they launched. Tommy Hilfiger collaborated with Kith and Palace managed to corrupt Ralph Lauren and its cuddly Polo Bear. And the Palace x Ralph Lauren collaboration may have marked the moment the ground beneath us fully shifted. The sold-out boat shoe is what happens in a post-Heelfip Bear world. But Twitter-fodder collaborations aren’t solely responsible for the style’s comeback. Noah’s designer Brendon Babenzien is ensuring that prep’s native brands can pull their own weight, too. Babenzien recently started working on a full line with Sperry, titled the Cloud collection. Like Babenzien’s done with the collab items, there are boat shoes with mismatched colors—and in single interesting ones, like lemon yellow or forest green. Part of the boat shoe and prep’s comeback can be explained by fashion’s cyclical unceasing churn, but the timing of this particular style’s comeback is what’s head scratching. Writing about Rowing Blazers, GQ staffer Sam Hine grappled with why prep’s comeback is happening now. There has probably never been more animosity toward those who pay country club dues. Noah’s newest boat shoe has me thinking: maybe by costuming ourselves in their style, we can grab it back, or at least scramble the symbolism. Maybe that’s overthinking it and we really just are at the mercy of whatever the fashion cycle dictates—what’s uncool always becomes cool again; what’s oversaturated always falls out of favor. Either way, Noah’s sold-out boat shoe makes it feel like a full-on prep comeback is much closer than people may think. If boot-cut jeans can make a valiant return, boat shoes should meet much less hashtagged resistance.